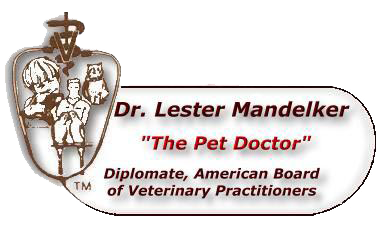 (thepetdoctor.com), Dr. Lester Mandelker is the only board certified specialist in Feline and Canine Practice in Pinellas County. He is a nationally recognized veterinarian and an expert in veterinary pharmacology, pet supplements and antioxidant therapy and pet health care. Questions submitted will be answered for educational and informational purposes concerning pet health care, and is not intended to diagnose and treat any illness or disease. No one can truly diagnose any disease or illness without taking a case history and performing a complete physical examination by a veterinarian. 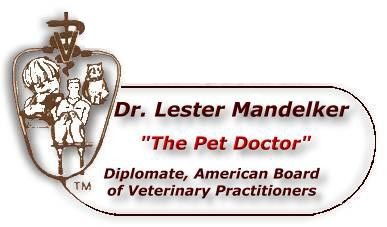 (thepetdoctor.com), will not be able to make a diagnosis or prescribe treatment with the information you provide. However, suggestions as to how to proceed with veterinary care can be discussed. Pertinent health information can also be found on our Pet Health Library Page. Please provide any information about your pet's condition that you can. Include any tentative diagnosis made, how long the problem has been going on, describe your pet's problem/condition, and provide any treatments/medications your pet has received.